Happy holidays from Carolina Foods! 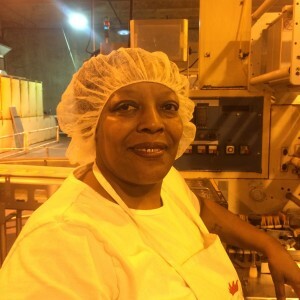 This month’s employee spotlight is Jeanette Grier. Thank you Jeannette for your 35 years of hard work! How long have you worked for Carolina Foods? What is your position at the company? Please list/describe all positions you have held. What is your favorite Carolina Foods Duchess product? Coconut Pies and Honey Buns. They are great when they are hot! What is one of your favorite things about your job? Running the wrappers – it keeps me busy and on my toes. Please share a fun fact about yourself. I am active on my church. I like to travel and spend time with my family. At Carolina Foods, we make all of our products using the finest ingredients, blended in house to ensure that we have superior taste and quality. Once you taste our baked goods you will come back wanting more.